Chair, Swedish Doctors for Human Rights – SWEDHR. As voices of protest in the US against the arming of the above mentioned “rebels” has increased (to the point that they were halted during a brief period) the US government expects that its client states in the EU will replace US in shipping supplies to the “rebels”. The utilization of Sweden in this regard is convenient in two ways: Despite the subservient stance towards NATO in particular during the past Carl Bildt era, the Swedish authorities play still the “non-alignment” card, giving hence the impression of a “neutral country”; and on the other hand, Sweden has a history of secret deals regarding weapons-export with the Saudis. The law in Sweden forbids the export of weapons to parties/zones in on-going military conflict. However, the Swedish authorities, the military and the weapons-export complex ‘led’ ultimately by magnate Jacob Wallenberg have already breached the Swedish law in those regards. Apart of the explicit prohibition to provide weapons to factions in actual conflict, it should be noted that under the Swedish law all kind of arms shipments for export purposes have to be controlled by (the ‘independent’) Swedish Agency for Non-Proliferation and Export Controls (ISP). This was not the case of “Project Simoom”, when Sweden’s Defence Research Agency (FOI), an authority under the Ministry of Defence, initiated a secret arms deals with the Saudis already in 2007 and later through an up-front firm aimed to cover the operation. The secret arms deal was about the Swedes constructing a weapon factory in Saudi Arabia. The armaments would consist of “weapons of point”, which is also the type of weaponry used by ISIS forces against Syrian army’s armoured vehicles. As these vehicles are of Russian fabrication, also gives NATO-prone Sweden an opportunity to test in combat their weaponry technique. When the deal was exposed, the Swedish prosecutors had to initiate an investigation, for as I pointed above, it was law-against. However, the prosecutors rapidly closed the investigation and in spite of the evidence the case was shutdown because “there was no reason to prosecute“. Meanwhile, the phony, no-evidence case against the WikiLeaks founder Mr Julian Assange was tightened even more by the Swedish prosecutors; meaning, they ostracised the case to a complete abandonment for years. By the time of the exposures, Jacob Wallenberg, who among a variety of other companies was a director of Saab’s and Ericsson’s board, wrote to the Swedish defence minister that “his ‘Saudi friends’ in the business world were not happy, and that the decision to stop work on the factory ‘threatened important business interests’.” According to The Local, these interests particularly consisted in acquisitions by Saudis of the Swedish system Erieye, an airborne surveillance technique produced by Saab Electronic Defense Systems, formerly Ericsson Microwave Systems. As a result of these pressures exercised by the arms-deal magnate Wallenberg on behalf of the Saudis, and his own financial interests, the deal continued. 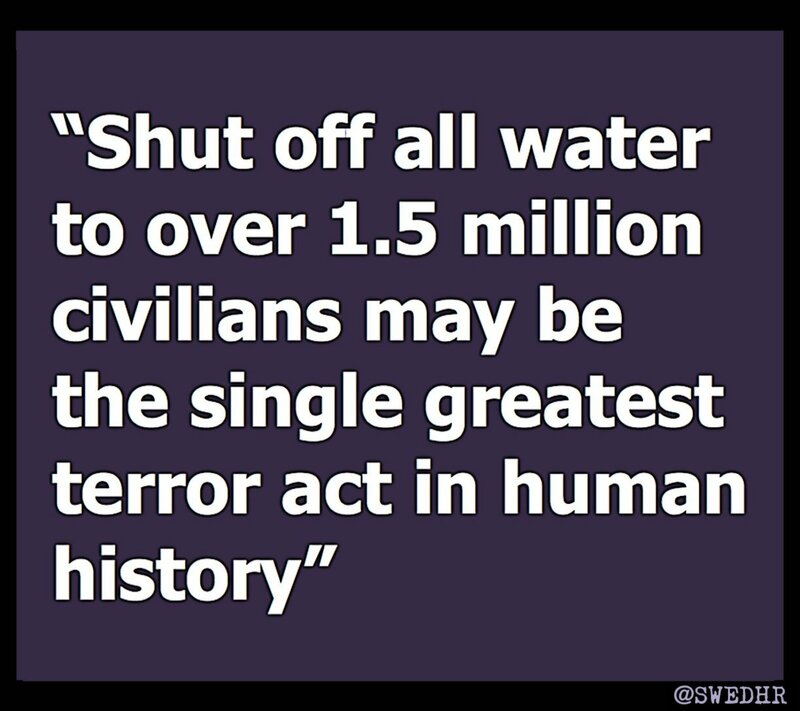 Sweden then disregarded the atrocities committed by Saudis for instance in Yemen, and the basic violation to the human rights, women rights, and civil rights in Saudi Arabia. It took three years after the above-mentioned incident for the Swedish government to finally cancel the commercial agreement with Saudi Arabia. In this cancellation, the foreign minister Margot Wallström had a central role. When this was announced on March 2015, Jacob Wallenberg initiated a secret campaign among the most prominent figures of the financial and industrial complex of Sweden to try to stop that cancellation. 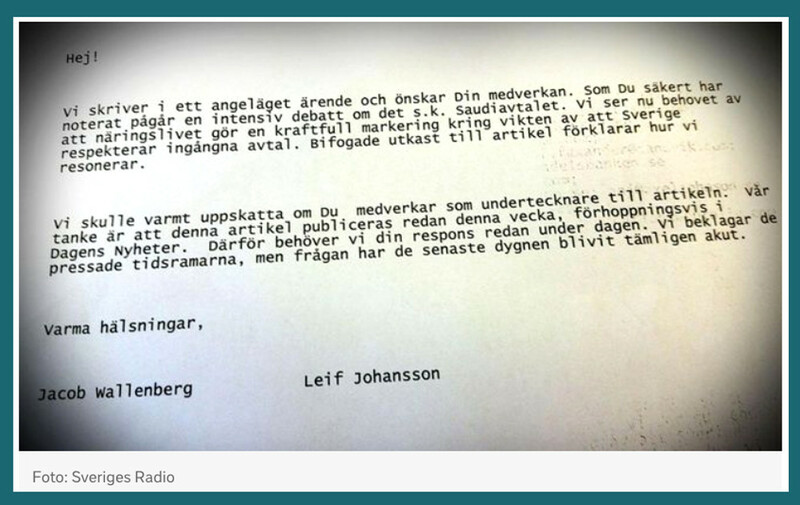 In a confidential email, which was later exposed in the Swedish media,  Jacob Wallenberg requests his top of the Swedish industry peers to sign an appeal opposing the cancellation of the Saudi deal, appeal that was later published in the main Swedish paper Dagens Nyheter. A facsimile of Wallenberg’s email in the image below. Further, and less than two weeks after Margot Wallström’s announcement on Saudi Arabia, PM Stefan Löfven invited Jacob Wallenberg and a few other prominent finance tops to a copious dinner at the government residence Sagerska huset on the 15 of March this year. Another magnate assisting at the dinner, Carl Bennet, said to Aftonbladet that “the government wished to be informed about the situation in Saudi Arabia, and what our appraisal is on that situation”. Carl Bennet was also a cosignatory of the appeal published in DN. Now the arms-dealer magnate Wallenberg and the Swedish PM Löfven are sitting in a Swedish governmental plane heading to Saudi Arabia. Meanwhile the human rights tragedy among the civilian populations targeted by the Saudi-led coalition in Yemen or, to rephrase, its participation in the US-led coalition in Syria continues mortally and unabated. I wonder what the human-rights principled FM Margot Wallström thinks about all this. I also wonder if Wallenberg & Löfven are taking with them another Swedish medal to bestow onto the Saudi King. October 22, 2016 in Uncategorized.